It is close to 65 years since an order for North American-built diesel locomotives was placed by East Pakistan. Richard Gennis takes a brief look at the Bangladesh Railways EMD ‘B12’ diesel class that is still working today. Arriving at Dhaka Biman Bandar station with train 33 Up from Chittagong on December 14, 2013 is No. 2037. The GM was taken off its container train at Akhaura to replace a failed locomotive half its age. 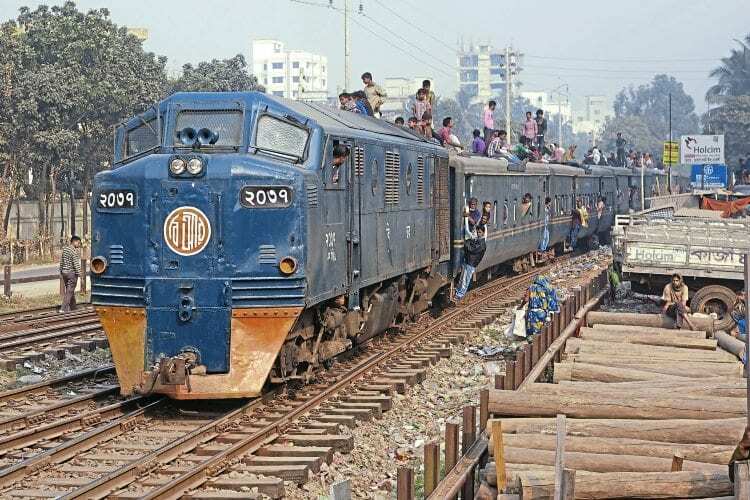 Note the dual-gauge track, which is common around the capital Dhaka. Although the loco number looks like 2009, the numerals are in Bengali, so appear like symbols. ALL PICTURES BY THE AUTHOR. Back in 1952 when East Pakistan (now Bangladesh) decided it was going down the diesel route, I doubt that few of the people involved in their purchase could have imagined that these locos would still be in use in 2016! The Eastern Bengal Railway (as it was called then) took delivery of 40 metre gauge ‘B12’ locomotives from General Motors, built at its London plant in Ontario, Canada. They came in three separate batches, the first of the locos arriving in August 1953 and the final delivery was in April 1956. Strangely there was only one other export customer for this type of loco and that was Brazil with only nine locomotives delivered with a B-B wheel arrangement.